Do you know the word, "kidult?" A "kidult" is a compound word of "Kid" and "Adult." It is used to indicate some adults who are over 20 years old and still have childlike habits or thinking. These days, the number of kidults is growing. Furthermore, kidults have been regarded as positive. In the past, those who had childlike hobbies tried to hide from the public, and the public thought that kidults were not fitting in with their own age. Compared with the past, many people accept and enjoy kidult culture. Let's learn about "kidults"! As individualism is prevailing in our society, the power of the kidult gets stronger. The kidult market has grown by 40% every year. Furthermore, the market value of kidult culture has reached over 500 billion won. In order to follow this trend, diverse corporations take advantage of collaborations with popular characters among the adults in their marketing. In their commercial, they use childlike characters such as Mickey Mouse, Iron Man, or Hello Kitty to catch consumers' attention. For instance, Baskin Robbins 31 released their new ice cream cake decorated by figures of the Hulk or Iron Man. By using popular characters among kidults, Baskin Robbins 31 could increase their profits drastically. 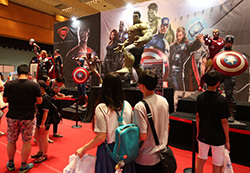 The sale of the Avengers' hero cake showed a 70 % increase compared to other ice cream products. Painting pictures and sketching is an interesting type of play to children. This activity has gotten popularity among kidults. The only difference between children's painting and adults' is that adults' is much more delicate than children's. The collection of adults' painting play is called as coloring book. This popularity started with one British artist's book, "Secret Garden." Coloring books has ranked in Top 10 best seller all over the world. The reason why adults enjoy painting pictures is that it can heal their mind. Sitting silently and drawing empty parts of an elaborate picture can get rid of negative and unproductive thinking. Especially when they finish painting the picture, adults can feel the pleasure of accomplishment and this accomplishment can remove the stress from daily life. Furthermore, the activity of painting pictures reminds adults of a heart-warming memory that they had in childhood. Reminiscence from childhood has a crucial role to attract adults to painting. CP reporter introduces the 2015 Kidult Expo, one of the kidult exhibitions. This EXPO was held from March 26 to March 29. 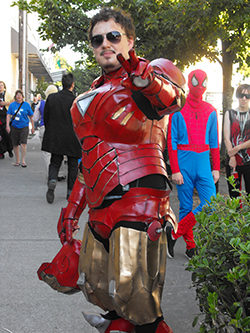 People of all ages could participate in EXPO. There are many toy figures from the old figures to hand-made figures. There are also a lot of experience zones in which kids can enjoy doing things such as trying out the cooking class zone, the Lego making zone, and more. Why don't you enjoy the next 2016 Kidult EXPO to recall your own childhood? Various kidult cultures of nations. We also have a different kidult culture aside from Korea, such as the one in Japan. In Japan, a cat robot called "Dream Cat Venus" is in fashion lately. This robot resembles not only the appearance of a cat but also the behavior pattern of a cat. These days, dream cat became popular. Japan is one of the powerful nations in terms of costume play. An engineer who is over 50 years old likes to wear female high school student's school uniform. Some people think that it’s not a normal behavior, but most people don't blame him. Instead, they give respect to him. The man participated in a TV commercial and became a well-known person. USA is a powerful nation in terms of kidult culture, in which its industrial scale is $1 trillion. According to the scholars, it is natural that people love books, characters, and food from earlier in their lives. So scholar says that kidult culture is natural to many people. Kidult movies also appear recently, such as Ted (2012) and Ted 2(2015). Furthermore, 3D printer technology receives attraction because of the merit of making figures easily. How to see kidult culture? Kidults are people who feel happy when they feel young again. In other words, kidults have a pure heart like the kids who find joy by playing with small toys, such as dolls or robots. Sometimes kidult culture focuses on childish thoughts rather than mature ones. However, there is no valid reason to blame kidult culture; it should not be blamed and instead should be respected. Everyone in their childhood have queries about robots or dolls. If you are already tired of being an adult who suffers from a lot of stress and many complex situations, why don't you try to become a kidult who feels happy even with small things?